Object-oriented databases were originally developed as an alternative to relational database technology for the representation, storage, and access of non-traditional data forms that were increasingly found in advanced applications of database technology. After much debate regarding object-oriented versus relational database technology, object-oriented extensions were eventually incorporated into relational technology to create object-relational databases. Both object-oriented databases and object-relational databases, collectively known as object databases, provide inherent support for object features, such as object identity, classes, inheritance hierarchies, and associations between classes using object references. 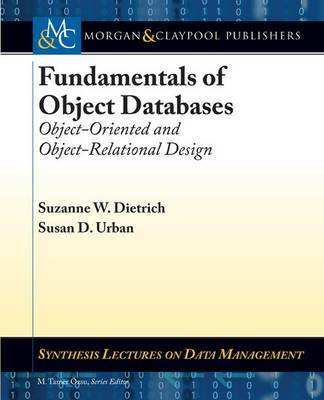 This monograph presents the fundamentals of object databases, with a specific focus on conceptual modeling of object database designs. After an introduction to the fundamental concepts of object-oriented data, the monograph provides a review of object-oriented conceptual modeling techniques using side-by-side Enhanced Entity Relationship diagrams and Unified Modeling Language conceptual class diagrams that feature class hierarchies with specialization constraints and object associations. These object-oriented conceptual models provide the basis for introducing case studies that illustrate the use of object features within the design of object-oriented and object-relational databases. For the object-oriented database perspective, the Object Data Management Group data definition language provides a portable, language-independent specification of an object schema, together with an SQL-like object query language. LINQ (Language INtegrated Query) is presented as a case study of an object query language together with its use in the db4o open-source object-oriented database. For the object-relational perspective, the object-relational features of the SQL standard are presented together with an accompanying case study of the object-relational features of Oracle. For completeness of coverage, an appendix provides a mapping of object-oriented conceptual designs to the relational model and its associated constraints.